Virtual Africa is a website with some amazing 360 degree panoramas of Africa. The site includes a number of Google Maps of regions of South Africa each containing a collection of interactive panoramic images. Clicking on any of the map markers opens an information window with an embedded panorama. The panoramas automatically scrolls through 360 degrees or you can use your mouse to interact with the image. The areas of South Africa covered include Cape Town, a number of national parks and Robben Island. Roundus is another website that is dedicated to documenting the world through virtual reality photography. 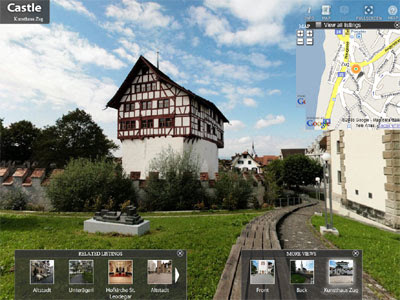 Roundus uses a large Google Map to show the location of the site's interactive panoramas and includes small pop-up Google Maps in individual panoramas to show a zoomed in view of where the panorama was taken. At the moment Roundus mainly has panoramas of the US and Switzerland. I recommend viewing the panoramas in full screen. As you can see from the screenshot above it is possible to check where the panorama was taken with a pop-up map, get information about the location and navigate to nearby panoramas via thumbnail images. Thanks for sharing the info on ROUNDUS.com! Great to see our work is reaching people! We're currently working on adding a StreetView layer to our panorama player so that site visitors can explore the site using Google's panos as well as our own! Thanks again for writing about us!